At first all the attention was a bit overwhelming. 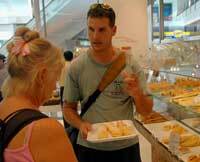 None of the crew knew how to react, so we made the mistake of being polite and engaging the vendors and hustlers in conversation. (They speak decent English, at least enough to really drive you crazy. Do you know how hard it is to avoid answering when someone asks “Hello! How are you doing?”. It may be their only English phrase, but it is a perfect trap for people bound by manners to answer.) Mom has a unique ability to draw a ring of merchants wherever she goes. After a couple of days, we figured out that “How are you doing?” actually has little to do with their curiosity and more to do with a booby trap. Now I say “No thanks” and keep walking. Seems to work (although not for mom…she still has a posse). Balinese traffic is quite insane. The transportation of choice is motor scooter, and whole families zip up and down the streets without any apparent regard for their lives or the laws of physics. 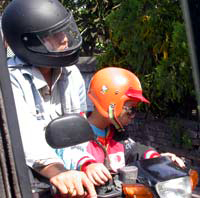 It is very common to see little kids wedged between their parents or hanging on to the handlebars. 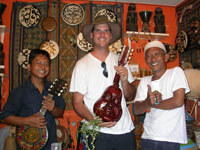 The coolest thing we found in Bali is a little music shop on Bemo Corner. 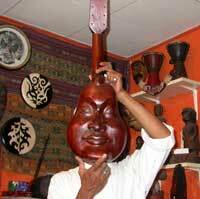 It is run by Rudy and Augus, who design and make most of the instruments they sell. Rudy is a cross between Mr. Miyagi and Bob Marley. We got along instantly. I bought a few instruments that I couldn’t resist, including the world’s coolest ukulele. It has eight strings, is tuned like a guitar, sounds like a mandolin, and has a body carved into a face. It is the first one they have ever made, so they were happy when I promised to take care of it as I would my own child. They still made me pay, though. 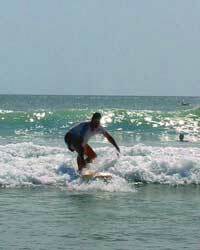 Yesterday I went surfing down on Kuta Beach. The waves here are far friendlier than any I have previously been in, which meant I actually stood up. At this rate, I will turn pro by the time I am 90. Kuta Beach is also where we got out coolest souvenirs: blow dart guns. Seriously. How cool is that? They are made of bamboo and when assembled, about four feet long. Each blowgun comes with five sharp wooden darts. The guy on the beach demonstrated by shooting a palm tree with a wooden dart. 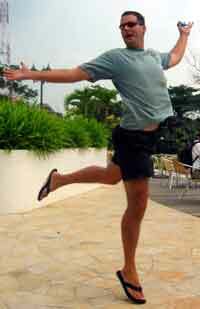 Yesterday a different guy shot his rubber flip flop. Inspired, I shot a hole in one of mom’s pillows. (She doesn’t know yet and I’m not telling her.) At any rate, it is good to know that if we ever need to hunt our own food, we can feast on wild pillow, tree, or flip flop (I’ve heard those are tougher to stalk, because they generally have a strong sense of smell). 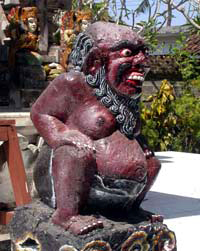 The major religion in Bali is Hindu, and there are shrines and temples everywhere. 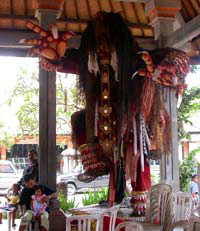 Balinese dancing was an experience. The show we attended was more of a musical story, which would have been a bit more engaging if we spoke Balinese, but was still interesting. I felt a bit bad for the actors because they were delivering all their best (and possibly riveting, or quite hilarious) dialogue to a roomful of foreigners who didn’t understand anything. From my limited vocabulary, the story seemed to be about roast camel. 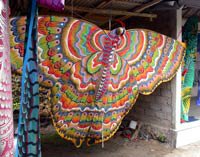 Some of the most beautiful Balinese crafts are their kites. We have seen kites similar to these in other countries like Sri Lanka, so it was interesting to see their versions. Mom and dad bought a kite shaped like a sailing ship. I wanted one of the five-meter-wide butterflies but it wouldn’t fit in the car. I suppose we could always have flown it from the car while we drove back, but a five meter kite probably generates enough lift to make that a very bad idea. 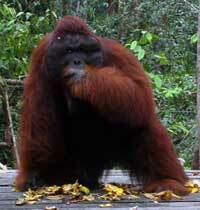 Tomorrow we leave for Singapore, possibly stopping in Borneo to see orangutans along the way. Should take 7-8 days of sailing in total, but we’ll see what happens with the wind. A water spout (think “water-skiing tornado”) bid us farewell from Bali as we sailed out of Benoa Harbor. Fortunately it dissipated after a few minutes, or more precisely, almost exactly as soon as I managed to pull out the video camera and point it in the right direction. So instead of a mighty, random, and destructive force of nature, my footage shows an out-of-focus grey strand of droopy spaghetti. Alas. The currents in this part of the world are pretty brutal. Sailing around the northwestern tip of Bali meant going against the current for most of the day, so progress was slow. At the tip of the island, we encountered some big standing waves. (Standing waves occur when the wind direction is opposite of the current. Essentially, they are waves that stay in one place, like rapids in a river.) This wouldn’t have been a problem except that we were flying our most-difficult-to-take-down-in-rough-water sail when we hit the waves. Standing waves normally occur in small localized patches, but this time there were miles of them…and plenty of wind…Too much wind, in fact. Between shipping and fishing vessels, ocean traffic is the greatest concern in this region of the world. 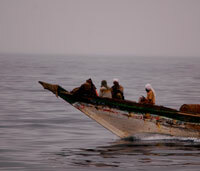 We spend a good deal of time dodging fishing vessels in particular. For some reason, the preferred fishing method seems to be floating long nets in the shipping lanes. Fortunately all of the nets we have encountered have been deep enough to sail over or marked well enough to go around. But we occasionally hear of cruisers who entangle their propeller in a fishing net and spend a few hours cutting themselves out (which, not surprisingly, irritates the fishermen…and they have gaff hooks and knives and stuff…). It is amazing how much wildlife you encounter on the open ocean. 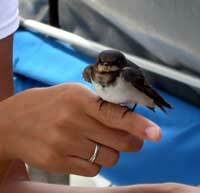 We circled enormous jellyfish, chased sea snakes, and provided a rest stop for tired little birds. It is incredible to see these little guys flitting about in the middle of nowhere, with no land in sight. They rely on the wind to give them lift so they don’t have to flap their wings constantly, so when it doesn’t blow they need somewhere to rest. The orangutans were one more example of an excellent experience you could never have in America thanks to lawyers and a lack of rainforest ecosystems. Local entrepreneurs (a nice guy named Harry) run a thriving tourist industry for cruisers and adventure-oriented tourists. The tour operator picked us up at our boat, left a company employee (Harry’s brother) on board Exit Only for security, and we took off for a day long boat cruise through the national park. 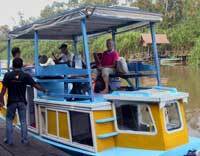 The tour boat had a crew of three including a guide, a driver, and a cook. The trip included lunch and dinner, and there were even pillows and mattresses on the top deck to lounge about on…most excellent. 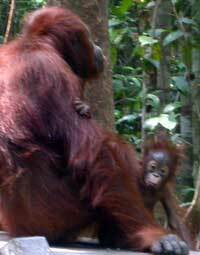 We met other tourists at the orangutan feeding platforms. They seemed a pretty normal lot, with the exception an annoying Japanese fellow who kept scaring the monkeys away by getting too close and taking pictures. The feeding platforms are flat wooden tables in the rainforest, surrounded by benches. The guides place bananas and coconut milk down, then wail “Come and get it!” in orangutan, which sounds something like “Moaaaaaaaaaaaaaaaaa…….”. You know the orangutans are coming when you hear the cracking of branches and swishing of trees. Stealth is not their strong point, but they can climb anything and are completely fearless about heights. Orangutans are much stronger than they look and WAY stronger than people. I was impressed with the size of the females until I saw a dominant male named “Win”. Males are easy to tell from females because they have huge cheeks, thicker bodies, and they aren’t carrying babies. Dominant males jealously protect their harem from other males. While we were there, things got a little hairy because another male made advances towards one of Win’s females, which really irritated Win. At the same time, an orangutan seductress wandered over to the other side of our group and made Win nervous about us being between them, so he came back to us and made his presence known. The other male took this as a chance to resume his advances, so Win had to deal with him again. Meanwhile, the Japanese guy kept yelling “Win! Win! Win!” and shooting pictures in Win’s face in an apparent attempt at suicide. The orangutans were not afraid of people, and the guides shepherded us away from any potential conflicts (usually by saying things like “Don’t stand between a male and a female” and “Watch out”…which to us, carried as much weight as “Run for your life!”). Indonesia is the only place in the world where there are orangutans, so it was incredible to see them in the wild. Sadly, their numbers are dwindling quickly because of mining, illegal logging, and poaching. As a side note, I need to mention that we also saw wild boar. My childhood was spent reading Asterix comics, which feature wild boar, so it was a real bonus to see one in real life. I had no idea their noses were pink. After Kalimantan we headed for Singapore. Along the way, Sarah sailed across the equator for the first time, so we did a brief ceremony to commemorate the event. Traditionally, the captain dresses up like King Neptune and holds a mock trial condemning first time-crossers for crimes against the seas…then he punishes the “criminals” by making them wriggle around in a container of flour and water or some other nasty concoction…then the “criminals” are keel-hauled (dragged underneath the boat from one side to the other on a rope)….after which they have paid their dues, so they become “shellbacks”. Instead, we put Sarah in a hammock chair, hung it over the side, and dipped her feet in the cool, refreshing water. She will tell you I dropped her too low in the water on purpose, but don’t believe her. Sarah put this picture up. 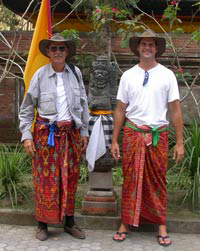 Abbott men are known for their fashion sense. Big Kite or Hang-glider of Doom? You decide. McWilliams. Coming to a town near you. He thpeakth withp a lithp. Thufferin Thuckatath. so I can go motor scootering. in the chairs have nightmares. 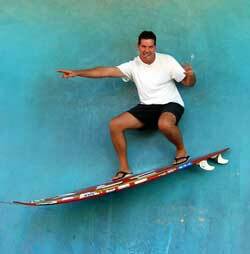 Much like that of Bigfoot, photographic evidence of me actually surfing is quite rare.